Where else can you find moosehide beadwork picture frames, nature-inspired ornaments, hand-crafted ivory earrings, spiced low-bush cranberry jams, and mustard made from local craft beer? Look no further for all these uncommon presents! 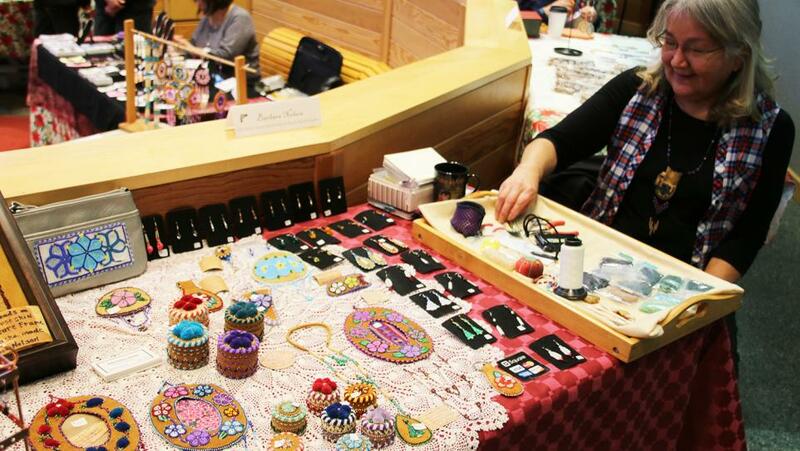 Fairbanks artisans offer an abundance of creative products at numerous local gift shows during November and December. Holiday bazaars and markets are a great way for visitors to get a snapshot of local life in the Far North. Fairbanks and North Pole shopping locales are excellent places to mingle with friendly sourdoughs and also find ingenious, often beautiful, one-of-a-kind keepsakes from your trip to the subarctic. Our extraordinarily talented pool of local artisans offer Made-In-Alaska foods, jewelry, artworks, glassware, textiles and Alaska Native keepsakes for locals and visitors to give their friends and family. The holidays can be a joyous time of year but they can also be stressful - so here’s a rundown of upcoming bazaars, fairs and markets in the Fairbanks area to help make your holiday shopping a breeze. These events are presented in date order. All dates and times are subject to change without notice. For more information, check the event listing** or search for specific Facebook event pages. Fri. Dec. 7 - First Friday in Fairbanks! Locations vary around town. Check the events calendar for listings. **Have an event listing? Submit events to our community calendar!